Something about pickling has always sounded so complicated to me…brines versus cures, acidity and fermentation, blah, blah, blah. I’ll just leave the mysterious intricacies of anaerobic fermentation up to Rick, and not clog up my own (much needed) personal brainspace, thanks very much. But a quick pickle…God, even I should be able to do something called a “quick pickle,” right? A good place to start for beet-loving, picking virgins like myself is this recipe from last month’s Martha Stewart Living. Trust me, these are easy…so easy, in fact, that after making one batch, I considered myself expert enough to make a second! The first batch was made with red beets, and the second with the striped variety (although the stripes were basically washed away with the hot pickling liquid). Don’t fear the Thai chile…these are not spicy pickles; a gentle backnote is all you get from its heat. Remember that these pickles are not canned and sealed in a water bath, so do get them into the fridge straightaway and store them there. Give the beets a day or two to relax in their bath before opening the jar. Then they’ll be ready to eat straight-up, to be made into a snappy salad with feta and mint, or to be put Aussie-style on a burger (and preferably enjoyed with a Coopers Sparkling). Supposedly they’ll keep for a month, but I can guarantee you that mine won’t make it a week. -Scrub, trim, and peel your two beets. Slice thinly (a mandoline works best), and transfer to a jar. -Split the fresh Thai chile in half. Bring chile, rice vinegar, sugar, fresh bay leaf, and black peppercorns to a boil in a small saucepan. -Pour hot mixture over beets. Seal jar and refrigerate. Beets will keep for one month. Mmmm, sounds interestng! AND worth a try. 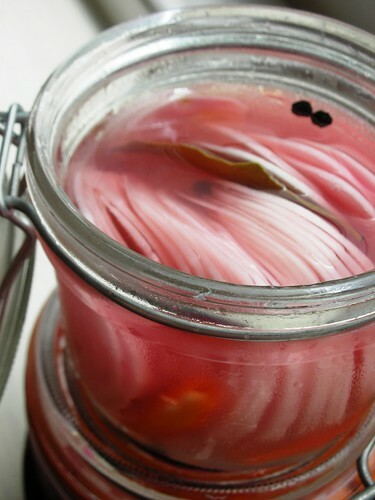 I do love pickled beets, they remind me of my grammy who made them every year (sniff, sniff). Oooh these look so pretty! 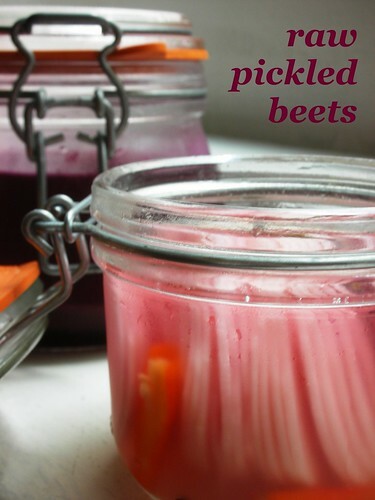 I’ve never attempted pickling either, but might have to now! Oh, I’m a serious beet lover, and was just wondering this week, what else I could do with them. Thanks for sharing! Looks delicious and it sounds like an Asian-fusion pickle because of the addition of chillies. Was it messy as beet does stain a bit? It’s not too messy, as it was just a couple of beets…just use a big cutting board when you slice them up. Some people wear rubber gloves when handling them, but I never bother. The color washes off hands pretty easily. How beautiful. Pickling is great fun. I just started reading a great new book called Well Preserved by Eugenia Bone. It’s got some very creative jams, pickles, and other wonderful preserved foods. She writes in such a way that it all sounds very doable. I caught myself thinking I need to try some of the cured meat recipes. Curing my own meats seems ridiculous until I read about it in her book. I have seen this book at the bookstore. Was debating whether or not to get it, actually. Excellent! Mine are gone, too, and am looking forward to making a batch with golden beets next! I do have some beets I’ve been looking for something different to do with. I think I’ll try this! Thanks for stopping by the Unfussy Epicure and leaving a comment! Sounds like a good recipe, but it is NOT adapted from Martha Stewart’s recipe. It is her exact same recipe, word for word. actually, i did add a couple of notes to it that weren’t in the original…not to mention that i clearly state (and link to) the source, both in the post and in the recipe.